Today I am posting here Chicken Biryani made using Pressure cooker.There are different versions of biryani. This Pressure cooker Chicken biryani is the simpler version which can be made quick and easy. This is a one pot meal. If you are a beginner or you don't want to go through the elaborate process and not spend much time to cook, but want an aromatic and delightful biryani, then this recipe is just right for you. Apart from the time taken for marination, this biryani will be ready in minutes. 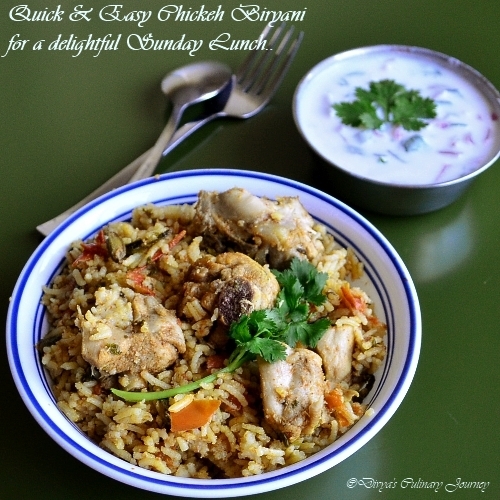 This is a quick and easy to make version of Chicken Biryani made using Pressure Cooker. Following this recipe one can prepare delicious Chicken Biryani in no time. Large Red Onion : 1 no. Chilli Powder : 1 Teaspoon. First clean the chicken and mix all the ingredients listed under " to marinate" and set it aside for atleast an hour. You can even plan ahead and marinate the night before and leave it fridge. Wash the rice and drain excess water and set it aside, just right before starting cooking process. Chop the onions (Lengthwise), cilantro, mint, slit green chillies and set them aside. Heat oil in the pressure cooker, add fennel seeds, cinnamon, cloves, cardamom, bay leaves and fry for a minute or two. Then add the chopped onions, slit green chillies and fry till the onions turn translucent. Now add the chopped tomatoes, cilantro, mint leaves, ginger garlic paste, chilli powder and cook till the tomatoes turn mushy. Then add the marinated chicken, along with the marinade and cover the cooker & cook for 4-5 minutes. (Just cover with a lid). Now add the rice and water, adjust the salt and add some ghee mix well and pressure cook in medium for one whistle.Turn off the heat. Let the pressure release and wait for 5 minutes then fluff it up and serve with Raitha. Chicken will release water, So the amount of gravy in the cooker after cooking chicken, should be considered before adding water for rice. Usually 2.5 to 3 cups of water will do. Be generous in adding oil and ghee. After the pressure is released, wait for sometime to let it set before fluffing it up. Otherwise if done immediately the rice will be broken. Mouth watering clicks, feel like grabbing it! I remember one of my friend used to make biriyani in pressure cooker, Looks delicious. Tempting biriyani...Back at home mom makes it in cooker.. I too make biriyani in pressure cooker only...quick and easy... biriyani looks yummy and mouthwatering. Mouthwatering !!!! My fav and even I used to prepare the same way!!! A recipe to be made for the children. Looks nice and tasty. Hi just wondering if I can make this dish without a pressure cooker? Instead of pressure cooker, you can use electric rice cooker. First use a skillet,to cook, follow till step 7. Then transfer the chicken and the gravy to an electric rice cooker, add rice and required water and cook. Mouthwatering.. I want some now!! SUper flavourful briyani,love pressure cooker version very much. Thank you very much. I made it. Was worried about the amount of water. It turned out perfect, except for the spice level. I will add more chilli powder/green chilli next time. 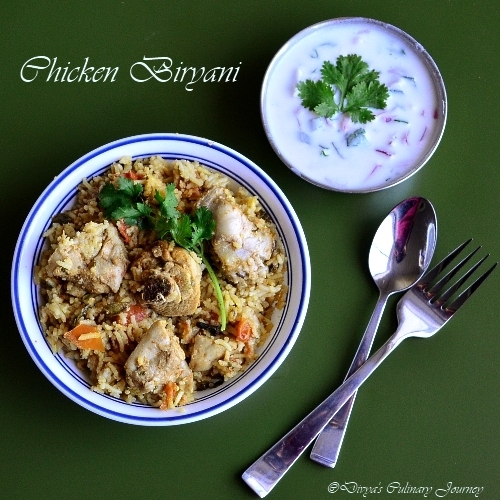 I love chicken biryani and this delicious dish of yours is inspiring me to make it again! Yum!